Greetings from the Lexington Farmers Market! We are taking over FMC’s Instagram for the duration of two weeks to share with you a look into our market. Our market is loved by our community and for good reason! As a new “visitor” at our market, there are a few things you ought to know to fully appreciate the market that surrounds you. For over 40 years we have helped bring local, fresh products into the heart of Downtown Lexington, Kentucky. Although Kentucky has long been known for its tobacco, we are proud of our native sons (like John Bibb, Wendel Berry, and our very own market member Bill Best) and daughters (such as Barbara Kingsolver and Ouita Michel) that have worked tirelessly to help make all aspects of local agriculture a venerated and viable vocation. The mission of our member-owned cooperative is to provide a living wage for our area farmers; conserve our farm land; provide Lexington with fresh, high-quality agricultural products; save family farms; and stimulate the local economy. Market members range in age from early 20s to over 80, representing 28 different counties, and different backgrounds. We are exciting to have a wide selection of heirloom beans and tomatoes, products derived from the burgeoning hemp industry (including CBD oil products), award-winning farm-to-vase flower growers, and ark-of-taste hog farmers! We were also the first market in the state to allow a local craft beer company and one of our wine makers has been on the cutting edge of bourbon barreling aging. We are also proud of our community involvement. 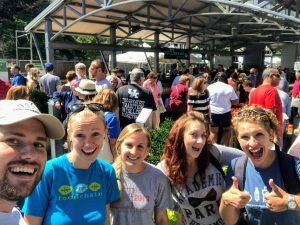 We were one of the first markets to offer SNAP benefits at a market in Kentucky, and throughout the 10 years of that program we have worked with other organizations to bring a double dollar’s program to Kentucky; one that also matches WIC and Senior Farmers Market Nutrition Program benefits. We have a robust POP Club for kids. And most recently we have been able to launch a makers market that highlights locally handcrafted goods ranging from felted animals to jewelry featuring our state rock (the agate). Our market has also had its fair share of challenges. Lexington’s downtown has grown up around us and demand for space and construction have impacted our market footprint and parking. We have also had to address membership concerns from high land cost to the general trend of aging farmers. We have debated topics such as 100% homegrown vs. allowing resale, fee structures, and seniority for hours and hours. And we have consoled each other as long time customers and market members have passed away. Farmers can get a bad rap for being irascible or cantankerous but the long hours and stress can take a toll on their outward appearance. However, having spent over 5 summers with the LFM, I’ve grown to see that inside each farmer is a hopeful, adventurous spirit. Willing to take risks. Willing to get up early and work late. Willing to stand outside in the snow or blazing sun. Willing to make a difference. And I hope you can experience that spirit when you visit either our year round Saturday market or one of other 4 seasonal market locations throughout Lexington, Kentucky. We are so excited to take over FMC’s Instagram account because we want to share our beautiful city and wonderful farmers. We want to inspire those markets and farmers that are down on themselves. We also want feedback on what you think we could improve and to hear about your experiences. We hope what we share transports you to our market and makes you feel truly welcome. We hope what we share transports you to our market and makes you feel truly welcome!